Solar powered drapes with motorization are just one of the modern, elegant and beautiful solutions BTX offers for covering windows, sliding glass doors, and other wide openings. One of the bolder window fashion design trends for 2014, it has never been easier to make a statement through solar powered motorized drapery. Not only are BTX motorized window coverings flexible, affordable, and user-friendly but they have some very cool new technology to boast. There are many advantages to buying motorized blinds over regular blinds. Learn how easy it is to install and operate solar powered motorized drapery track systems in this post. Featuring solar panels, one remote control for six single systems, and built in radio technology – these workhorses make your life easier with integration to current home automation. Designed for use in almost any application, motorized drapery systems are good for almost all customers despite their experience or technical background. The BTX Classic Motor has been part of BTX’s offerings for more than twenty years, yet still proves one of the most reliable drapery systems in the industry. Recommended for: heavier applications, hotels, commercial buildings, and residences with large and/or curved drapery systems. The Classic comes with some of the highest capacity ratings available and is an AC-powered workhorse for ultimate strength and reliability. This video demonstrates the range of features available through BTX’s world-renowned drapery program and the cornerstone of the BTX Intelligent Fashion™ program. With the recent addition of the Coulisse Portfolio of designer shading solutions to BTX’s motorization offerings, clients benefit from a well-rounded program of power, control, and simplicity. The BTX Tumo Drapery System has built-in radio control and Smart Touch technology with Tumo drapery tracks that provide convenience and control at an affordable price point. Recommended for: residential, hospitality, and some commercial applications. An out-of-the-box solution, this solar powered drapery track system can pull up to 45 lbs. with a single motor (or 90 lbs. for Tandem motors), and it can also be hand-drawn using BTX’s Smart Touch technology. Tumo tracks are easy to install, with no electrician required, and even easier to operate. Just plug the motor into the solar panel and it’s ready to go. This video gives an overview of the advantages of BTX solar-powered drapes. 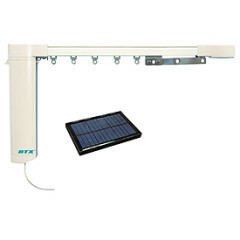 The BTX Tumo solar drapery track is a unique, sun-powered curtain system that can be installed and operated without any wiring as an ideal DC-powered solution. One remote can control up to six single systems, or six groups of systems using built-in radio technology. For those seeking to integrate this with an existing home automation system, it can be easily added using a dry-contact closure. This system is designed to work with other shading solutions offered by BTX, making it flexible, affordable, and user-friendly. The BTX Futura System is the latest addition to the BTX Intelligent Fashion line of drapery systems. The Futura is a strong, AC-powered drapery track with 2.4 GHz bidirectional control technology built-in. This combination allows for a range of control options such as wireless integration, or mesh-network while maintaining a higher weight capacity. Recommended for: Heavier applications, very large windows, large or multiple bed windows, and complex control systems. This video demonstrates the options and flexibility of the new motorized panel tracks available from BTX Intelligent Fashion™. As part of the Coulisse Portfolio, these panel track systems bring a new dimension to contemporary shading design. This new style of panel track system features a modern aesthetic, advanced technology, easy installation, and intuitive operation. Can’t decide which motorized drapery system? Speak with one of our knowledgeable consultants at 3 Blind Mice Window Coverings to choose the best option. If you would like to learn more about keeping your child safe when it comes to your window coverings, call us at 858-452-6100, or set up an appointment to speak with one of our experienced window treatment designers. It’s fabulous, I need to know more information about the product.